I have been asked by a former employee to supply them with a reference for a new job in another company and that company has now sent me a fairly lengthy list of questions about my views on the employee. Unfortunately this employee had been a very poor performer – should I reflect this in their reference? If I do is there likely to be any come back on me if the individual doesn’t get the job because of it? Firstly unless the former employee has a written agreement with you – usually in their contract of employment, or you work in a regulated industry such as financial services, you are not bound to give a reference at all. You should however have a consistent policy on this and not pick and choose who you will give references for to avoid accusations of discrimination or victimisation. If you do decide to supply a reference, then you can decide the information that you are willing to provide regardless of what information has been requested. It is important to ensure that any information you give is a true, accurate, is a fair reflection of the individual concerned and is given without malice. This should be based on facts about that individual which you can substantiate if required to do so. You should avoid giving any subjective opinions – especially if they reflect badly on the individual – unless you can back these up with factual examples. Do not give an unfair or misleading impression overall, and you should also not speculate about how you think the employee might perform in any future new role. Performance, attendance and sickness absences are often requested by prospective employers, however the risk is that these issues may be due to the employee suffering from a disability and such comments may be viewed as discriminatory. Therefore such references should generally be avoided. If the employee was dismissed from your employment it is permissible to state this in the reference, as well as the reasons for dismissal. Incidentally you may get a request from time to time for a telephone reference – our recommendation is that such requests should be declined other than in exceptional circumstances since information given in this way could be subject to misinterpretation. Where telephone references are given, the information should again be based on fact and the reference should be followed up immediately with a written reference which reflects what was said on the phone. In the event that a job applicant is unhappy with a reference provided about them they can formally request from you, usually in writing, a copy of any reference sent to a new employer. 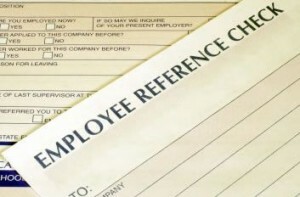 To be honest the simplest way to be totally up front with the employee is to send a copy of the reference to them when you send it to the employer who has requested it. This ensures they know exactly what you have said about them, and if they feel necessary they can challenge it before it impacts on the decision of their potential future employer. So what are the implications if the individual doesn’t get the new job because of the reference you have written? If the ex-employee thinks they’ve been given an unfair or misleading reference, they may be able to claim damages in court. The ex-employee or the recipient employer can bring legal claims against you if they think they’ve been given an unfair, misleading or malicious reference, or where the reference is not prepared with due care and attention. Therefore you must take care to ensure you take reasonable care as to the factual content, and to the opinions you have expressed; you must be able to back up the comments made in the reference, for example by being able to supply examples of relevant documents if required e.g. warning letters etc.